Habitat: Desert, Upland. This wildflower grows in sunny, open areas in deserts, grasslands, and open woodlands. Flowering Season: Spring, Summer, Fall. 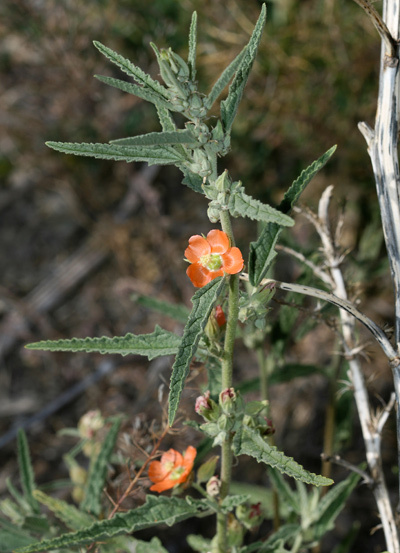 This plant blooms anytime there is sufficient rainfall during the warm months of the year. Description: The short-stemmed, 1 inch (2.5 cm) wide flowers emerge from the leaf axils and have 5 broad, cupped petals and yellow anthers. The flowers are followed by pumpkin-shaped schizocarps (fruit) with 9 to 17 mericarps (segments), each containing 2 seeds. The leaves are light grayish green, alternate, hairy, variably toothed, scalloped, or smooth-edged, sometimes angularly lobed near the base, linear-lanceolate in shape, and distinctively narrow (less than 1/3 wide as long). The stems are erect and covered in star-shaped hairs like the rest of the plant. 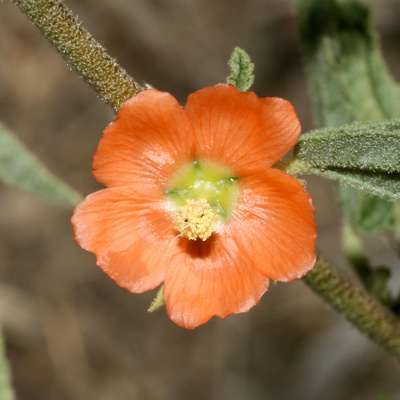 No other, similar Sphaeralcea species found here has such relatively narrow leaves.